Well it has been a while, Wharncliffe is one of those spots that you that if you dont ride there for a couple of months, something new will have been built. A new jump, berm or most often a whole new track. And while Truffle Shuffle isn’t the newest addition, it was shamefully the first time I had seen it. Starting next to NEMBA, Truffle Shuffle combines all that is great about Wharncliffe. 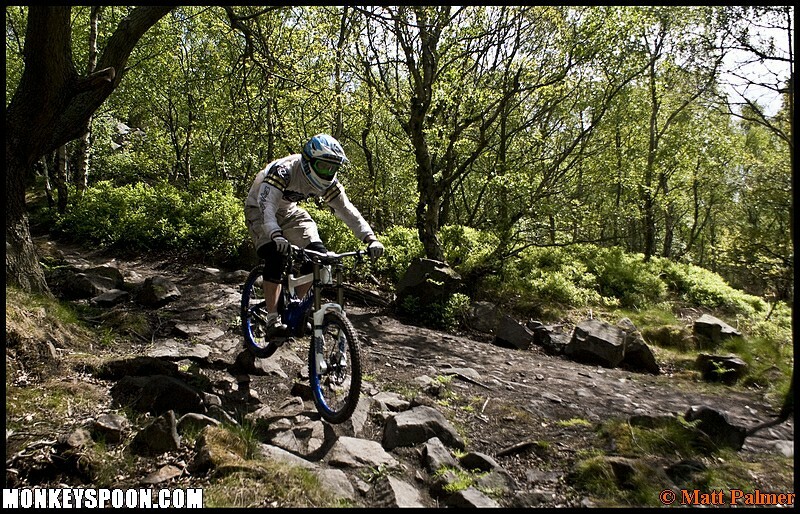 Technical rock gardens, flat out speed and some steeper sections to test those brakes. I have not been on the downhill bike as much as I would like and was feeling quite rusty for the first couple of runs. But after much pushing and hanging around we managed to get to the bottom of the track. We then did a run down Alexander Super Trout which is a little more bedded in than last time I rode it! Jeff was trying out his new tripod, lense and external mic. He learnt a valuable lesson – don’t switch off the mic and forget to switch it back on! About this time last month Irwin and I (Jeff) met up with Joe Bowman and Rob Stokes (of ThisiSheffield fame) for some late afternoon riding of a new track at Wharncliffe:- ‘Alexander Super Trout’ (you can ask Rob where the name came from). It’s a good track, quite steep in places and, unusually for Wharncliffe, doesn’t have that many rocks in it. Appropriately, considering his plan to become a ‘mountain bike personality’ rather than actually having to ride a bike, Rob soon crashed and sustained a finger injury preventing from further riding. This left Joe and Irwin to do most of the riding for the video and since the light was going we only got the top half of the track, but apart from that not a bad little video IMO. 10-09-26 Wharncliffe JI+JK+JB+RS, 7 Pictures by Jeff. James W and Irwin riding Nemba at Wharncliffe, with some dual action. It all went well ’til James W came off and blew a seal in his Boxxers and then Irwin, feeling left out, decided to come off and break his seat clamp and gears. But apart from that it was a good morning in the woods. Here is a video filmed by myself following Matt P on a recent trip to Wharncliffe. Including full runs of (in order) Diamandback, XC descent line and NEMBA. Summer has final arrived with Wharncliffe almost being dry. 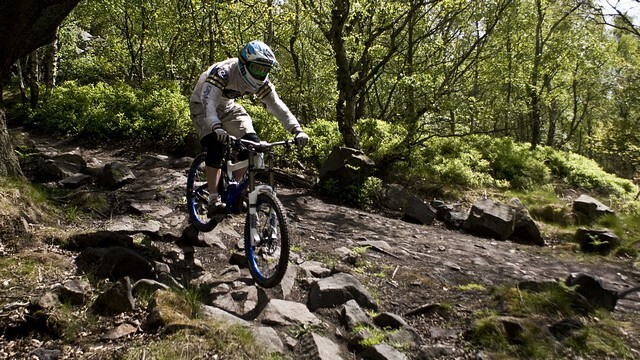 So myself and James W have been riding at Wharncliffe a far bit recently. So I thought it was about time we got Jeff along to do some filming. There have been some new additions and alterations to the tracks at Wharncliffe of late which is great to see. We were joined by Matt P not long after we entered the woods, once he had found us he took a couple of pictures in-between riding. Although he did complain to me that the sun was catching him out. As it was very sunny one minute then rather overcast the next. We rode a couple of the old favourites such as “NEMBA” and “The fast course” and even had a quick attempt at “Peatys” and then ventured onto some relatively new stuff. “Dogs” as it is known is abit shorter than most of the other tracks in the woods as it goes almost straight down the hill. I have to say it must be one of my favourite tracks in the woods. Anyway enjoy the video!